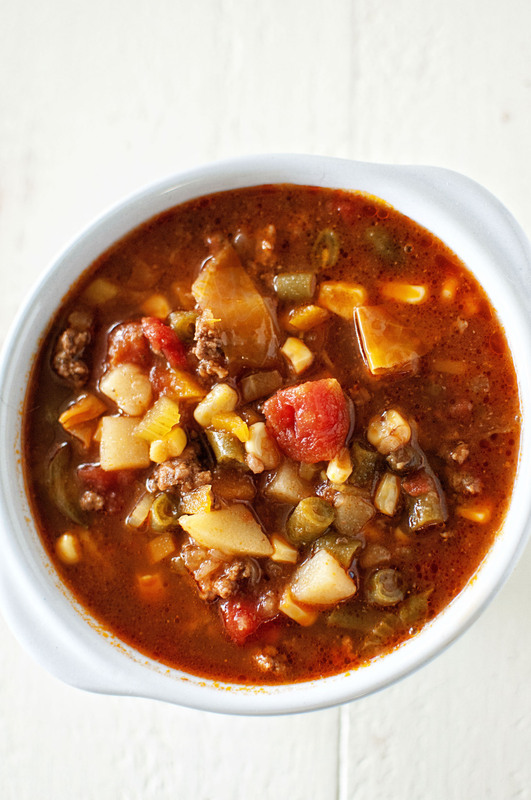 Vegetable Hamburger Soup: Hearty soup chocked full of vegetables and hamburger to help keep the winter chill away. It’s a soup our family makes often. Growing up we ate a lot of soup during the fall and winter months. During the holiday times we ate a lot of Split Pea and Ham as well as Navy Bean Soup…that also had ham. It was a great way to use up the extra ham. Beef stew was made a lot as well. We had tomato soup but that was always Campbell’s and was always served with grilled cheese. My husband decided we needed a 50 pound bag of potatoes as well as a ton of hamburger from Costco a few weeks back. So I was in search of recipes that used hamburger and potatoes. 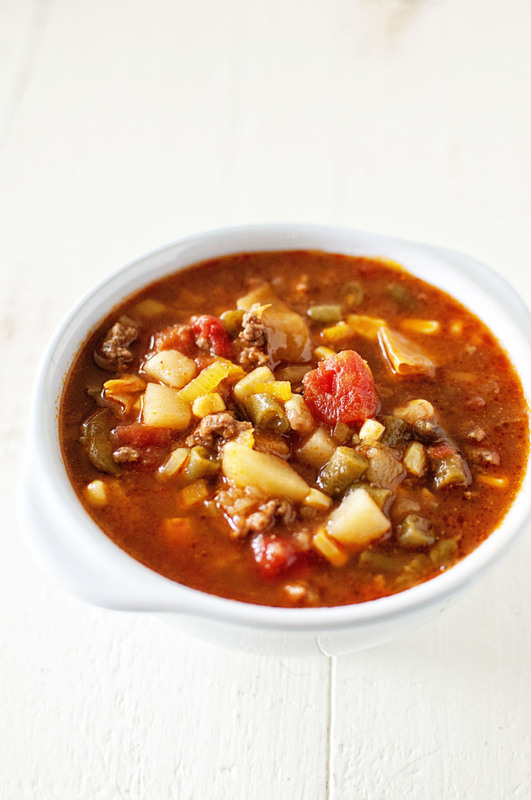 When I saw a recipe for Hamburger Soup I kind of assumed it was a soup with the taste of a hamburger. Turns out it’s basically beef stew using hamburger instead of beef chunks. 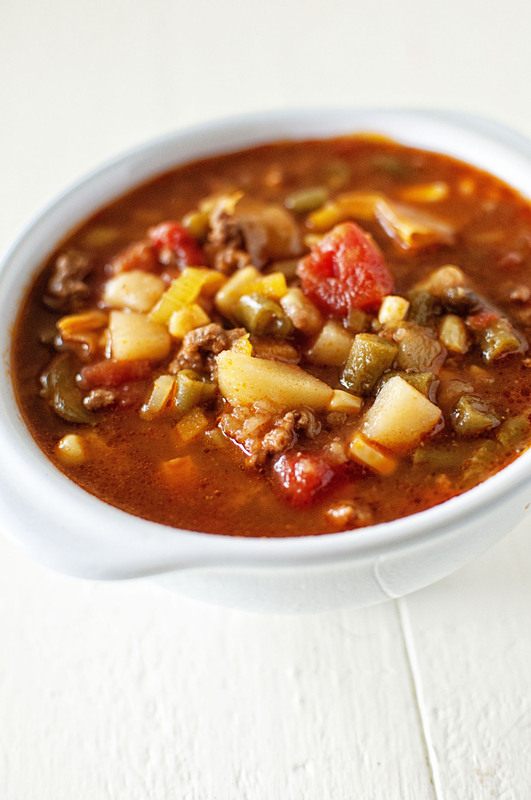 This soup is served a lot at my house and it tends to change a little each time I make it. What stays the same is the amount of beef stock, tomato sauce, diced tomatoes, onion, celery, carrots, and the amount of hamburger. The veggies change often depending on the season. Sometimes peas are in there. Sometimes celery root. It’s just kind of what we have around. Brown the meat in a large stock pot. If you are using 80/20 hamburger then you will not need to add a fat to cook it. If you are using leaner meat then you will need to cook the hamburger in a couple tsp. of olive oil. Reserve 2 TBSP of the meat and fat juice that is left after cooking the meat. Add the onions and celery to the pot and cook the onions until translucent. Add the garlic, potatoes, carrots, cabbage, corn, and green beans. Add the beef broth, diced tomatoes and juice, and tomato sauce. Once at a boil, reduce heat to a simmer. Let simmer for 45 minutes, stirring about every 10 minutes. This looks just perfect. We are a serious soup family and this covers all the bases of our favorite soup add ins. We’ll be trying it out soon! Verdict from kids: “This is super good.” I emptied out the produce drawers and added a bay leaf. They want it in their lunches tomorrow. Yay! Always a bonus when the kids approve! I used all frozen vegetables and added more salt and garlic powder. It was wonderful. I will be making this again. Thank you.